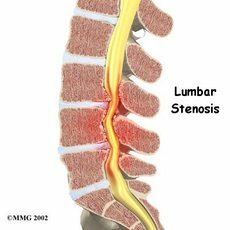 Lumbar canal stenosis, also called Spinal canal stenosis, is a narrowing in the spinal canal which causes pressure on the nerves going from the spine to the legs. It is caused by degenerative changes, ie. excess wear and tear, which leads to overgrowth of the ligaments and joints of the spine as well as bulge or prolapse of the spinal disc. Pressure on the nerves causes problems in their normal functioning. The patients suffers from pain or heaviness and numbness in the legs. This is typically brought on by standing and walking, and would be relieved by sitting down or lying down. This condition is invariably progressive, and the pain and numbness would increase and the amount of standing time and walking distance would decrease. In extreme cases there could even be weakness in the legs and problems with bladder control. The initial treatment would consist of exercise therapy and anti-inflammatory medication. Activities may need to be modified. However with progressive worsening, surgery remains the only solution to improve the patients quality of life. Before deciding on surgery, investigations could include special x-rays and an MRI scan to localize the problem and decide on the type of surgery. Surgery is aimed at relieving the pressure on the nerves (decompression). This is done in the least invasive way so as to prevent unnecessary structural damage to the spine. A laminectomy may be required in patients with severe and multi-level disease. However younger patients may benefit from a ‘micro-surgical internal decompression’, whereby the nerves are decompressed without removing the lamina. Some patients in addition may have ‘instability’ or spondylolisthesis and may require placement of screws and bone-graft (fusion).